Luxury cars offer services that dont come with standard cars. In the same light expensive wines are often older or come from a place attributed with quality. 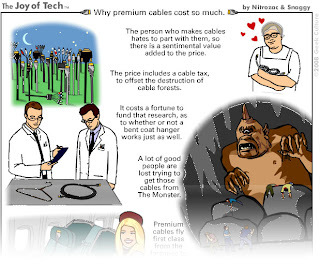 Monster cables are simply over priced for no apparent reason. That being said I feel no need to buy any of these. I've mentioned guitars on this site before (I'm the Mystery Commenter who said the thing about the guitar frets on the name inflation post) but there does appear to be little difference in quality between, for instance, guitars made by Epiphone and Gibson, even though Gibsons cost about five times as much. I don't think making something in America as opposed to China costs that much more, so it may be that people buy Gibsons mostly for an illusion of quality. Nonetheless, they do. Welcome back, Mystery Commenter! As for the whole "Made In America" thing, there are a number of factors at work there; as a mechanical engineer who's dealt with manufacturing both domestically and in China, I can say that it definitely does cost less to make things in China, mostly because labor costs there are a fraction of what they are in the US. But does the higher cost of US-made products mean they're higher quality? Not necessarily - it just means that the workers are better paid! That said, there are other advantages (which also add costs) to US production: more aggressive regulation here prevents lead-based paint or poison-contaminated pet food from happening as often, and US manufacturers are less likely to cut corners by using imitation materials. But whether all these differences between US and Chinese production cause differences in the quality of the overall product can only be determined on a case-by-case basis. Yup, it's kind of a crap shoot!